Web Design, Android App Development, SEO, Social Media Services, Application Development, Collaborative Intranet. Websites Ayrshire have you covered! Prices start from as low as £89.99! For a low deposit, low cost Website Design Solution, look no further. We can get started as soon as you want us to, and we will also make sure you are kept completely up to date, every step of the way. We’re with you, and we hope our service will speak for itself. Are you looking for attractive, high quality, website design in Ayrshire by a web designer who has years of experience? Perhaps you need some alterations to an existing website? 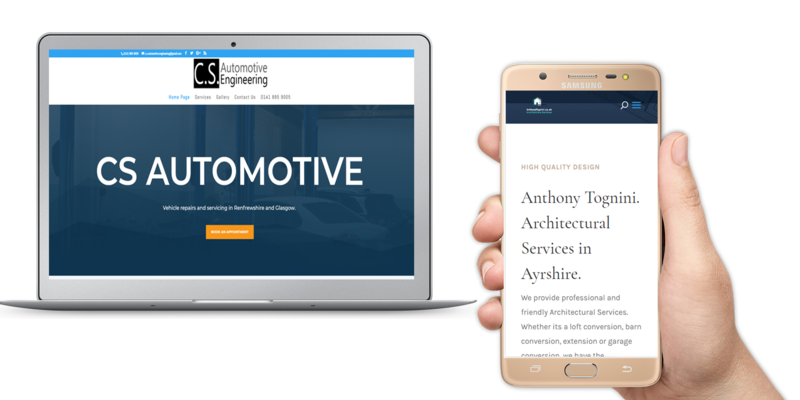 Websites Ayrshire cover everything from basic web design services, to much more advanced, bespoke software engineering and design. We’ve got Android App development covered too, so whether you’re looking for something to be designed or changed, or for some SEO or Social Media help, Websites Ayrshire can be trusted to help you get things moving! If it’s a new brand you’re launching, we can help. With a proven track record across multiple sectors we can help you deliver your brand to a wider audience. If you’re looking to promote your business through popular social media channels such as Facebook or Twitter give us a call and we can help! Website Development is our key business area. We are proud of our solutions and are sure you will be too if you choose us to deliver your perfect online business presence. We can help you get reached on search engines like Google and Bing. We will work with you to help build a strategy that can be both cost effective and result driven. Website Design in Ayrshire that puts you first. Our work for you doesn’t stop when we’ve published your project. We will work with you and your staff, or volunteers, and make sure everyone concerned is comprehensively trained and fully up-to-speed with our systems. Mobile Devices and Tablets? No Problem. Every project we put our heart and soul into is built to suit the specifications of multi device types, from standard Laptop and PC web browsers like Chrome and Firefox, to mobile platforms on Android and Apple devices. We will always make sure you are happy with how your website or other project looks. Just some of the web sites we’ve been working on! Stephen and the team done a great job with our site. From getting us online and launched in time to getting us to the top of the google rankings. We couldn’t be happier with the outcome. From the outset, Stephen understood the challenging and diverse nature of our business with competition at every corner. We believe we have been built a superb website and we enjoy working with Stephen when updates and additions are required. We contract Websites Ayrshire to build our website. From start to finish, the attention to detail was second-to-none and we would be happy to recommend to anyone!